Enhance your abilities to think and write critically by taking a deeper look into existing cultural assumptions. 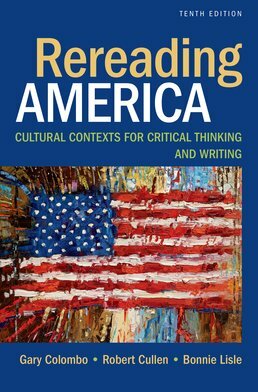 Rereading America probes the myths underlying these assumptions, as you spend time revisiting, revising, or defending them through your own writing. Gary Soto, "Looking for Work"
Stephanie Coontz, "What We Really Miss About the 1950s"
Naomi Gerstel and Natalia Sarkisian, "The Color of Family Ties: Race, Class, Gender, and Extended Family Involvement"
John Taylor Gatto, "Against School"
Mike Rose, "I Just Wanna Be Average"
Jonathan Kozol, "Still Separate, Still Unequal"
Eric Schmidt & Jared Cohen, "Our Future Selves"
Ta-Nehisi Coates, "The Case for Reparations"
Linda Holtzman and Leon Sharpe, "Theories and Constructs of Race"
*Marcelo M. Suarez-Orozco and Carola Suarez-Orozco, "How Immigrants Become 'Other'"
Gary Colombo is professor emeritus of English and ESL at Los Angeles City College. He has also published Mind Readings: An Anthology for Writers (2002), and with Bonnie Lisle and Sandra Mano, Frame Work: Culture, Storytelling and College Writing (1997), both for Bedford/St. Martins. Robert Cullen is professor emeritus of English at San Jose State University, where he taught a wide range of courses in writing, rhetoric, composition pedagogy, and American literature..
Bonnie Lisle teaches in the UCLA Writing Programs. With Gary Colombo and Sandra Mano, she is the author of Frame Work: Culture, Storytelling, and College Writing (Bedford/St. Martins, 1997).